We, a family with 4 children (17-21 years old), really enjoyed our stay at Podere Tina. The pictures on the website are nice, but when you are there it is even more beautiful and a fantastic location. A lovely quiet place in Tuscany with great possibilities outside the Podere. A visit to the lake Bolsena is certainly worth while, just like Monte Amiato, which is also a bit cooler. A lot of cute little villages nearby the estate. The condition and design of the estate is done with great attention and thought. A lot of nice places and everything is in perfect condition. The inside is like a home, quality stuff, cosy and no costs are spared. Enjoying the terras outside, but also enjoying the finish of the Tour at 5 p.m. on the comfy couch in the livingroom. Henri comprehends it fully. Every day he is there, but not in your face and sincerely looking for feedback and input from the guests. Wonderful fresh fruits and vegetables from the garden, delicious! A stay to never forget and a place to return to. First time I visited Podere Tina more than 10 years ago, it was business meeting of our international team. Then I came to Tina several times again, having different training sessions, meetings and even strategic EMEA planning. Being fascinated by villa I came later here already on private – with my wife and family friends. And then in April-May this year we came again with my wife Inna to enjoy Tina together. And every time Tina perfectly match expectation of your visit, every time you can discover different Tina. It can be business conference facility with flipcharts and coffee breaks, having brainstorm corners and teambuilding space. It can be party premises for close friends in big or small company with cooking classes, piece of meat and sip of wine together, backed up by memorable tours in medieval villages around. It can be romantic villa just for two with a fireplace in the room and remote benches outside to enjoy picturesque sunset and unbelievable foggy dawn. When visiting Tina I like to see that Tina remains the same and Tina is constantly changing. Every time I use to find another comfortable bench with different view at splendid Tuscany vicinity, or another footpath around villa hill, or additional comfortable place for grill and evening glass of wine, or another town around with century history and curve street to walk through. I like to come back to Tina and explore it, I like to feel it like home and discover it again and again. I think we with my wife have disclosed the main secret of Podere Tina. Main secret of Podere Tina is Henri, who had a dream about Tuscany, who has made his dream come true creating Tina and who is constantly thinking how to develop and make it more and more comfortable. We would like to thank you Henri for sharing your dream with your guests! We hope to come back again! Inna has put our impressions together in this video, and we are happy to share it at Podere Tina website. The best thing about “best kept secrets” is that they are secrets, so this is just between you and me, please don’t tell anyone else .. or they’ll all want to come. Podere Tina has been a huge part of both my, and my family’s lives, since we first started coming in 2002. As early as April and as late as November, I have brought various members of my family and many friends now seventeen times. Each visit has been a combination of total peace, tranquility and relaxation within the grounds of this wonderful Tuscanesque villa and visits to both regular haunts and new exploration. For my family members, and I, the treat of a visit here has more of a feeling of a homecoming than a vacation. This unspoilt region nestling at the bottom of Tuscany meeting Umbria and Lazio, appears unchanged for generations. Certainly coming from the UK, it is extremely rare to find the same shopkeepers, restaurateurs, neighbours, gardeners and housekeepers greeting us across two decades when we cannot say the same for our home environments over two years, but this uniqueness adds to the familiarity and warmth of coming back. “Tina” has been a wonderful base to explore much of middle Italy, and we have been blessed with exploring many famous sites in well-known cities and towns such as Florence, Rome, Siena, Orvieto and Montepulciano, as well as lesser-known obscure medieval towns such as Radicofani, Pienza, Saturnia, Pitigliano and San Casciano dei Bagni. Whether visiting the Roman Colliseum, the Florentine Uffizi, the Siennese Paleo or the vineyards of Montalcino and Orvieto, or the incredible natural hot springs of Saturnia, San Felipe and San Casciano dei Bagni, the 15th century Turkish “monster park” of Bomarzo, and the multitude of local superb restaurants, fattoria and gellateria, Podere Tina offers so much to do and see within just 90 minutes drive. Waking up to perfect silence and privacy and viewing the sunrise and sunset over the stunning landscapes reminds me of just how special “Tina” is. Together with the well equipped kitchens, well positioned outdoor dining areas, the most wonderful fruit, vegetables and meat available in this region (whether from the garden or the local shops), and wonderful wines from the private cantina, this is both a chef’s and gourmet’s paradise. Year by year, Podere Tina has experienced small improvements here and there, the garden matures, the internet access improves, the landscape changes with the seasons, but the soul remains, warm and welcoming, the swimming pool clear, inviting and refreshing, and the cantina stocked with some of the finest local wines and home-produced wines and olive oils. What’s more, it’s remarkably easy and cost-effective to get to from an increasing number of airports and routes (including Rome, Bologna, Pisa and Pescara), only a few hours door-to-door from home. We had a fantastic week with the whole family, three generations, 15 people, at Podere Tina: a beautiful farmhouse - but it felt more like a beautiful royal estate. The house has a soul, you can feel it is built and decorated with a lot of love, you'll feel right at home. The lovely design of the house, the colours, the choice of material: it's all very pure- very honest. Because of the lovely weather of July we spent most of our time around the portico, the lovely big garden with swings, the hammock, sunbeds and a lot of places to play but also a lot of places to relax- and of course the swimmingpool. What a view! Swimming in the pool before anyone is awake, is an etraordinay experience. We also enjoyed the delicious wines and olive oil from the Cantina and we enjoyed the pizzas which were made by Marysa and Simona in the authentic pizza oven. An out of the ordinary experience was the night that starchef Romana, who brought all the necessaries to Podere Tina, gave a cooking lessen to everyone. Lots of thankyous Henri for the way you were involved and stayed in contact with us. It was a privilege to stay at Podere Tina and it's a wonderful place to go back to (preferably a bit longer). I can't wait to come back. 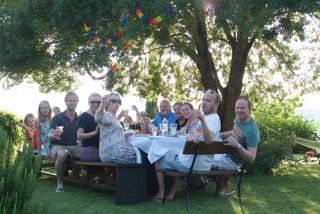 We had the opportunity to spend a week end of July at Podere Tina with our 7 grow ups and 5 grandchildren. Needles to say that the setting and beautiful neighbourhood are breathtaking, the pictures speak for themselves. The accommodation of the different living quarters is immaculate, each room brings his soul. Scattered around on the premises you find intimate sitting areas, every one of them allowing for peace, brilliant views, own fire place or bbq facility. The swimming pool on top of the hill is a perfect gathering place for a big family event as well for intimate night swimming under the stars. The owner has build up close relationship with local people who helped us in the most friendly way during our stay. The word podera Tina is our symbol for "lovely time". We have thoroughly enjoyed the silence, the serenity, the beauty of the setting sun, the coolness of the pool and much more. The hilltop location is unique, the immediate surroundings and the views around are heartwarming, the house is very tastefully decorated. The reception is welcoming. If you still just want to go out there are nice places to visit within short driving distance and walks are possible where there is constantly something to discover. You have something to talk about to get there, but it is worth it. In short: highly recommended. We look back on a fantastic holiday in podere la Tina. It is a place to dream and your love for the country and yard, is felt in every detail. We looked at the pictures of long time ago when you just had acquired La Tina and were started with the restoration / renovation. The pictures tell their own story. Every morning the landscape, scenery continued to surprise us, where it was almost impossible to see the majestic vistas in their totality. Games in the lovely pool, as formerly, long sagging with wine and limoncello, espresso Caciano dei Bagni, a day Montepulciano and a day Orvieto. Enjoyed the cooking class at La Romano Parolina, and what are Maryse and Simona great with their unsurpassed pizzas. Podere Tina, such a great ambiance and a stunning location. I had an amazing time staying at Podere Tina. An absolute recommendation.